She is the Cinematographer of Kasey Rae‘s All That You Love Will Be Carried Away Dollar Baby Film. Alexa Wolf: My name is Alexa Wolf and I am a New York City based Cinematographer. I have been living & working in the film industry in NYC since 2013, and I have a degree in Film & Electronic Arts from Bard College. I’m originally from Northern California, and when not on film sets I spend my time backpacking and riding horses. Alexa Wolf: I’ve known I wanted to work in the film industry since 5th grade, when I obsessively watched the special features on the Lord of the Rings DVD’s and decided that making movies was what I wanted to do. Without much outside guidance for my filmmaking passion though, it took until part way through college for me to understand the differences between departments in the industry and to narrow in on cinematography as my personal passion & goal. Alexa Wolf: Every director has their own unique working style, but I tend to start by asking what films or photography may have been on their mind while writing the script, and then adding to that list the references that came to my mind upon reading their script. From there we spend time looking at particular visual techniques and create a unique combination of these that can impart to our future audience the emotional undertones of the characters and themes present in the script. SKSM: You worked with Kasey Rae on this film, what do you think the relationship between a director and a DP should be? Alexa Wolf: Every director needs slightly different things from their DP, but I think the best collaborations (and the most enjoyable for me) come in an open creative dialogue where the director imparts their desires for tone and emotion and we together decide what visual techniques are best suited to support their story. I prefer to work closely in preproduction, so that once on set there is little need for creative rethinking, except for when the location or actors present some new & interesting creative alternative that neither the director or DP foresaw in preproduction. Kasey Rae was wonderful to work with – she had a clear creative vision but was open to suggestions and new techniques. Alexa Wolf: All That You Love Will Be Carried Away certainly was not the most challenging film I’ve shot, but it had its difficulties, mostly due to our tight budget and broken up shooting schedule. 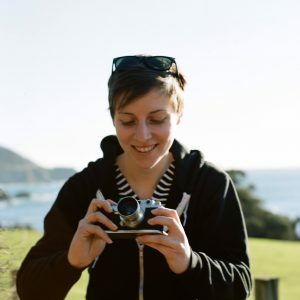 Alexa Wolf: As for shooting formats – I own an Arri Alexa Mini and shoot most of my projects on that camera, usually with the ProRes 4444 codec and 3.2K resolution. I love the camera’s dynamic range and highlight roll off as well as color rendition, and am pretty happy to shoot any project on it. As for lenses, I find they are one of my most important creative choices per project, as each set’s particular character plays such a vital role in the overall look of a film. For All That You Love Will Be Carried Away we shot on rehoused Cooke S2’s which are some of my favorite old spherical lenses. Unfortunately we had to use two different sets because of our broken up shooting schedule, and the look between the two sets was somewhat different. Alexa Wolf: For the scene where our protagonist is running through the snowy field, I had to do a lot of sprinting backwards while holding the camera in front of him. This turned into a bit of a comedy of errors, since running backwards in a foot and a half of snow with an expensive camera in hand definitely leads to a few close calls! Alexa Wolf: I’ve always been a big Roger Deakins fan, as well as Emmanuel Lubezki, Conrad Hall, Christopher Doyle, & many more! Some of my favorite films are In The Mood For Love, The Lobster, Children of Men, Beasts of the Southern Wild, A Serious Man, & anything by Taika Waititi or Wes Anderson. Alexa Wolf: I haven’t read a lot of Stephen King, but I do enjoy a lot of his short stories. Alexa Wolf: I’m mostly shooting a mix of short films, branded content, short documentaries, music videos, and commercials. I shot my first feature length narrative this past spring and have my next coming up later this winter. Alexa Wolf: My first time working on a large movie set in NYC wasn’t in the camera or lighting departments, but actually as a horse wrangler on the set of Winter’s Tale.